Rango | Three Cheers for Darkened Years! Gore Verbinski‘s animated feature “Rango” is being touted as a film for children, but it’s one of those refreshing children’s films that feels like it was made with adults in mind. This is not one of those insufferable talking-animal, CGI-animated, pop-culture-exploiting, pseudo-comedies that infects our fair land’s multiplexes (I’m thinking of anything from “Shark Tale” to “Madagascar” to, yes, even “Shrek”). This is a CGI-animated film that actually has a good deal of character, a point of view, and a quirky filmmaker who is clearly following his passions. When you look at a stylish, stylized action film like, say “300,” you get the feeling that there’s no passion behind the material; clearly the director is trying to make the film look as flashy as possible, and leans so heavily on style that all palpable, adult thought and much-needed cogency seem to fall by the wayside. Conversely, when you look at stylish, stylized action film like “Kill Bill,” you sense that the filmmaker has a personal interest in the style; in the case of “Kill Bill,” Tarantino was using his style to make a larger point about the way cinema can be used. The style is the substance. “Rango,” I am pleased to report, is a stylish pastiche more in the vein of Tarantino and a mindless fluffy kids’ film. This is a film you will enjoy more than your children do. 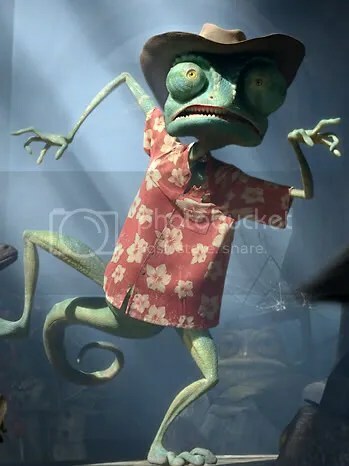 When “Rango” makes references to things like The Man With No Name, Kim Novak, Hunter S. Thompson (who actually makes an animated cameo), and “Chinatown,” you get the definite sense that they were included because the filmmaker thought they were genuinely interesting things, and not included for the sake of a cutesy joke. The politics in Dirt are a bit sketchy. The animals use water as currency, and they’re in the middle of a horrible drought. The town’s mayor, a tortoise played by Ned Beatty, is an old soul, but is clearly modeled after John Huston in “Chinatown,” so you know he’s up to something sinister. After accidentally killing a hawk (! ), Rango is appointed sheriff of this here, one-desert-chicken-burg, and is appointed the task of tracking down the water. It took a fellow critic to point this out to me (hi, William! 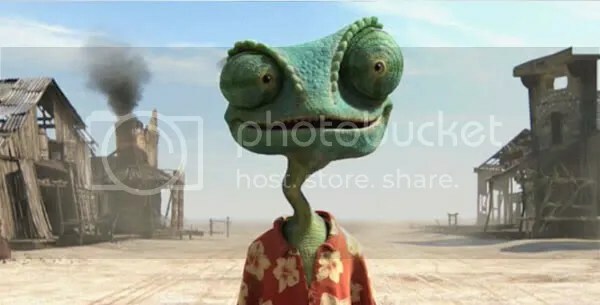 ), but Rango also represents an interesting existential dilemma as well: If you have no identity, and you are a blank slate, you may choose to live your life however you see fit. Our hero chameleon chooses to be a hero, and acts to live up to it. Is this not the core of existentialism? There’s also a wonderful moment of pure surrealism in “Rango” involving a quest to find water, and a series of slumping, spiky, walking Joshua trees that look like something out of a Dali painting. Watching the little chameleon following these peculiarly monstrous flora, shuffling through the desert sands is a singlual and dream-like experience. This film also has an excellent cast. Harry Dean Stanton appears as a blind, bank-robbing mole. Bill Nighy plays a wickedly awesome rattlesnake (who not only has a Lee Van Cleef hat and mustache, but bares a rotating Gatling gun where his rattle ought to be). Alfred Molina plays a Mexican armadillo who dispenses wisdom. Isla Fisher plays the hard-workin’ desert moll-slash-love interest. And Timothy Olyphant appears as a Clint Eastwood-like spirit. I predict that “Rango” will have a small, passionate cult in a few years. Check back with me then. See if I’m right.